Combine flour and salt into a mixing bowl. With your finger, make a well into the center of the mixture and add the olive oil and ½ cup of hot water into the well. Using a fork, gradually work the flour mixture into the water. Add the rest of the water if needed. The dough should be stiff and not too sticky. Knead the dough on a floured surface for 2-3 minutes then shape it into a disk and let it sit until you are ready to roll it through you pasta crank. When rolling the dough out, separate it into five pieces and put those through the crank individually. You will have to do this two or three times per piece. The dough should be about 1/8 of an inch thick. Wondering what to with the abundance of squash you see at the farmers’ markets this winter? This ravioli recipe is delightfully easy to make and a reliable hit with the family during the holiday season. Setup an assembly line in your kitchen and put your kids to work filling these tasty treats. Once the squash is soft and cool, peel off the skin and toss the flesh into a food processor. Blend the squash until creamy and then spoon 1 cup of the squash into a mixing bowl with one cup of ricotta and stir them together. (You will have left over squash puree which I suggest you freeze for future ravioli). Next add 1 tablespoon of finely chopped sage and 1 teaspoon of finely chopped thyme and about ¼ cup parmesan. Stir it all together and cover with a towel while you roll out the pasta dough. Now is a good time to start bowling your pasta water. Remember to add lots of salt! 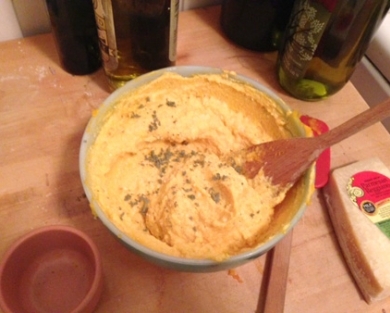 After rolling the dough, cut it into squares (2’’ by 2’’) and dollop a teaspoon of the squash mixture in the center. Trace the perimeter of the square with water and then affix a second square atop the first. Using the back of a fork, crimp the edges together. Put the finished ravioli in a dish lined with flour and dust each of the ravioli with a little flour so that they don’t stick together. 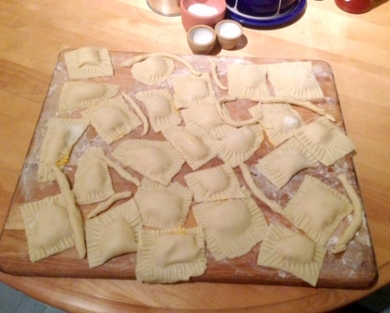 Once the ravioli assembly is finished, toss them into the boiling water. As the ravioli cook, sauté the spinach with the garlic so that everything is ready at approximately the same time. The ravioli with begin to float after 1-3 minutes of boiling. Once this happens, drain the water and plate them with a healthy helping of spinach on top (and a little drizzled olive oil). Bon appetite!